Until a few years ago Tofu to me was only a word associated with a food trend. Its structure, shape and possible uses were completely alien to me. Then something changed. I moved to the United States of America where fads are a dime a dozen. So for a while, apprehensive and not sure how to navigate the crazily abundant grocery store aisles, Tofu remained out of reach. Until, I realized, as so many Indians do that our beloved Paneer is hard to find. This recipe for Coconut Tofu Curry was born out of continued experiments with tofu. The grocery shopping space in America is unique. All chain stores cater to basic needs with very small sections for international food. As a result every migrant community has its own niche grocery stores. Indian grocery stores, often run by immigrants from countries in the subcontinent like India, Pakistan and Bangladesh, cater to the needs of the diaspora. Countries of the Indian subcontinent, a major chunk of South Asia, share a long and synchronous history of shared cultural practices and religious beliefs. This includes food. As a result regional influences dominate cuisine, transcending international borders. Moving to the USA has led to the creation of another kind of shared experience – that of sourcing ingredients from the homeland to serve fellow expats. South Asian businesspersons are authors of this new coexistence that manifests as a commercial transaction but serves a deeply cultural need. When I set out to find a South Asian/Indian grocery store in my first place of residence in New Jersey, I quickly realized that stocking up would be necessary due to the distance involved and the fact that without a drivers’ license I hadn’t started driving. Adapting whatever was available at the local grocery store became a norm and that’s when Tofu came into the picture. This is why I blog – more recipes and wisdom! The internet helped – a lot! 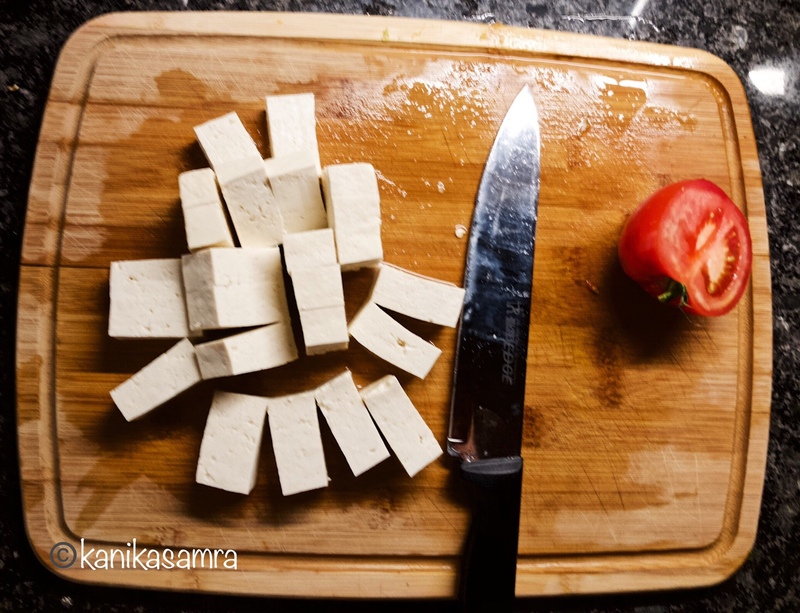 Multiple bloggers had shared how Tofu could serve as a replacement for paneer in various recipes. So, I began my own experiments and eventually started making Tofu in a coconut curry. This Thai food inspired curry is my favourite way to make Tofu. Hope it you like it too. Total Preparation Time ~ 30 minutes. The first step is to drain water from Tofu and keep it pressed to drain extra moisture within. To do this, place tofu on a large plate, then keep another plate on top. On top of this plate keep a heavy object like a jam jar, candle jar or a pestle. The reason we drain tofu is to allow it to become a sponge for the curry. If it is saturated with water then it won’t absorb flavor from the curry. While Tofu is draining, begin prepping your vegetables. Start by cleaning onion, washing pepper and tomato. Then slice them. Do not slice too fine. Next, take a heavy bottomed pan. I always use my cast iron skillet. Heat this on medium high heat. Another crucial thing to remember, a tip I learnt by watching a lot of Barefoot Contessa, is that oil should be added to a hot or warm skillet instead of starting with a cold skillet and cold oil. Heating them together often leads to overheating and smoking of oil. To oil add cumin seeds. When these start spluttering add garlic and onion. Sauté until onion slices become translucent. Follow by tomatoes. Cook until tomatoes are soft. Then add green pepper and cook for a few minutes. I like pepper crunchy but if you like it soft, cook for a few minutes until easily mashed. At this point check in on the Tofu. Remove Tofu from the plate, drain all the excess liquid and then slice it into inch thick pieces.6. Add all dry spices – salt and pepper, turmeric, cumin powder, coriander powder and chilli powder. Next add coconut milk and mix well. I use low-fat coconut milk. Whichever kind you choose, shake the can well before opening it. There is usually a thick layer of cream on the top without which you only get coconut water. Simmer the curry for 2-3 minutes on medium high heat. Then comes the final step of adding Tofu. Since Tofu is mostly protein, it has to be cooked gently on low heat to avoid coagulation. When cooked on high heat for a long time, proteins coagulate and congeal, making food tough and stringy to chew. Cover and simmer on low heat for 2 minutes. Turn off the heat and let it sit for another 2-3 minutes before serving. Enjoy with basmati rice or a bowl of Quinoa. This simple curry is easy to make and delicious. Tofu became my default vegetarian protein, when I couldn't find paneer. Read on for a healthy recipe. Drain water from Tofu and keep it pressed to drain extra moisture within. While Tofu is draining, begin prepping your vegetables. Start by cleaning onion, washing pepper and tomato - then slice them. Take a heavy bottomed pan and heat it on medium high heat. Add oil followed by cumin seeds. When seeds start spluttering add garlic and onion and sauté until onion is translucent. Then add green pepper and cook for a few minutes. Slice Tofu into inch thick pieces. Add all dry spices – salt and pepper, turmeric, cumin powder, coriander powder and chilli powder to the onions. Next add coconut milk and mix well. Simmer the curry for 2-3 minutes on medium high heat. Add Tofu and simmer, covered for another 5 minutes on low heat. This looks so nice and I am sure this will taste good. I will try this out some day. Thanks! 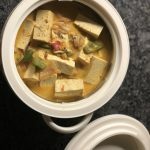 Would love to see your take on the Coconut Tofu Curry. I love tofu curries! Tofu really isn’t a fad. When I was in college in southern California in the early 70’s, it was simply an optional for vegetarians, which it is today. But I love your post! Thanks Mimi! I suppose the thing is that in Indja we’ve always, at least for a few generations, had Paneer which is sort of a cottage cheese but not crumbly. It comes in blocks much like Tofu. And we use Soya beans in other avatars- the beans themselves as stews or processed as nuggets. So from that perspective in India Tofu was a fad. But now I love it! Got it! I used to make paneer, but I remember defaulting to tofu in a pinch! we LOVE sag paneer!! !